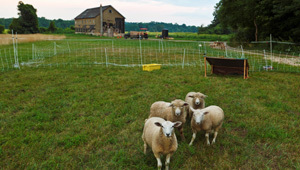 In 2010, The Trust for Public Land worked with the city of Northampton to conserve two farms along the Mill River, to preserve local farming for the community, and expand recreational opportunities. The Bean and Allard farms were Northampton's highest priorities for conservation and the city and a local task force had convened public forums to bring consensus to plans for the combined 181-acre properties. As part of the Connecticut River watershed, the Mill River is important for conserving water quality and riparian habitat. And the agricultural soils are of the highest quality and citizens identified local farming as critical to any conservation of the properties. Equally important to the community was development of new and much-needed athletic fields as the farms are also situated at the center of Northampton. The local nonprofit Grow Food Northampton has stepped in to rally support, funding, and farming for the lands, and the city's proposed Florence Fields (the athletic fields complex, including baseball diamonds) will be the centerpiece of the conservation effort and sit along the Mill River. The lands have roots in history too. Sojourner Truth, then a member of the local Northampton Association of Education and Industry, farmed the land in the 19th century. Interpretive signs are also planned.